After iTunes is installed and you've rebooted your PC, use your iPhone cable to connect your iPhone to your computer's USB port. iTunes should startup and sync your iPhone. You should see your iPhone in the Devices list on the left side of the iTunes window. 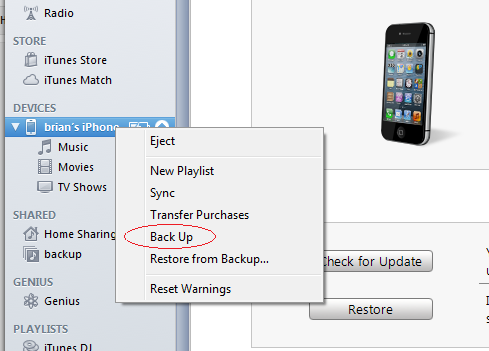 Now, right-click your iPhone in the iTunes window and select Backup. It may take a few minutes if you've got a lot of photos and music on your iPhone. Next, right-click your iPhone again, and select Restore From Backup. A dialog box will pop up showing a list of backups that have been done. The latest backup (that we just performed) should be selected. Click Restore. Again, it may take a few minutes. When the restore completes, your iPhone will automatically reboot. When the reboot is complete, right-click your iPhone in iTunes again, and click Eject. Now you can disconnect the cable, and your iPhone should be it's old fast self again.